Bought this tent second hand for our first camping trip. Thought I would put it up in the garden to avoid embarrassment when on a camp site. Made the fatal error of thinking that the in bag instructions would be all I needed to erect my tent in 20 minutes, silly me. When we arrived for our first outing it was very windy and I feared the worse. But with my better half holding the frame, I hooked on the inner tent and then pegged it out. The outer tent went on easily and with minor adjustments as I pegged it out it was all done in around 40 Minutes. The next few days it rained heavily with some strong gusts of wind. 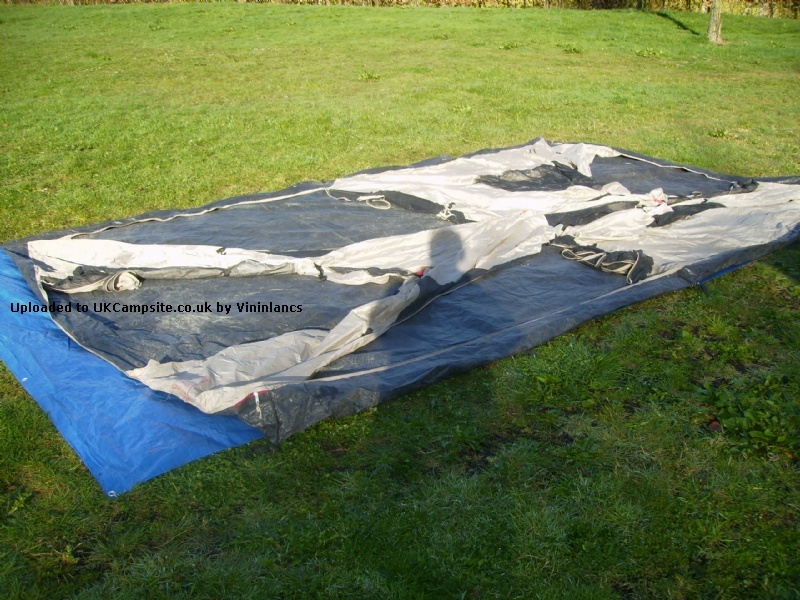 The tent never leaked a drop and stood up to the wind admirably. The tent is nicely laid out with the sleeping compartment at the back. This can be divided in half with the thin cloth curtain provided. Each half had ample room for a double air bed. The tent has 6 openings with mosquito nets on all. 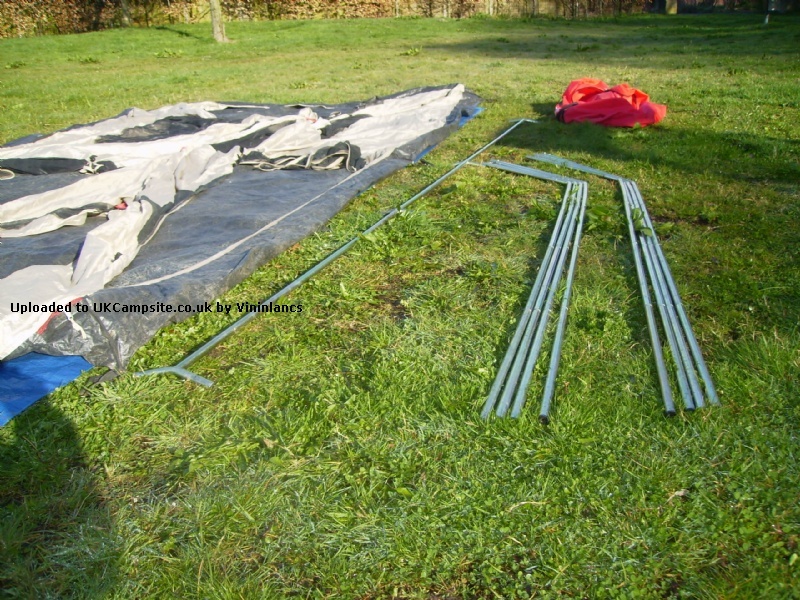 These can be rolled up or with the aid of the poles and ropes provided made into 6 small awnings. The ground tent is fully sewn in and of good quality. On the downside there are only 2 small pockets for your odds and sods. Overall I would say it's a very good tent with some nice touches i.E. 2 roof windows, ziperble air vent in bedroom+roof vent. Well, This tent is now 5 years old, and apart from looking a little faded has stood the test of time. 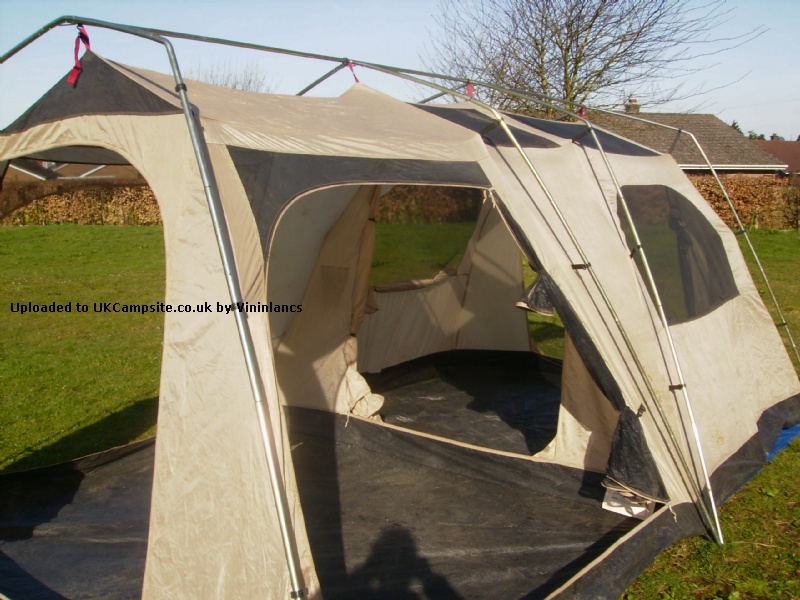 It is a well thought and and extremely well made tent.The steel poles all interlock and fasten to the inner and groundsheet with the ring and pin system It has one large sleeping area, the other half of the tent for chair and tables or whatever, but this space again could sleep another 4 people comfortably. 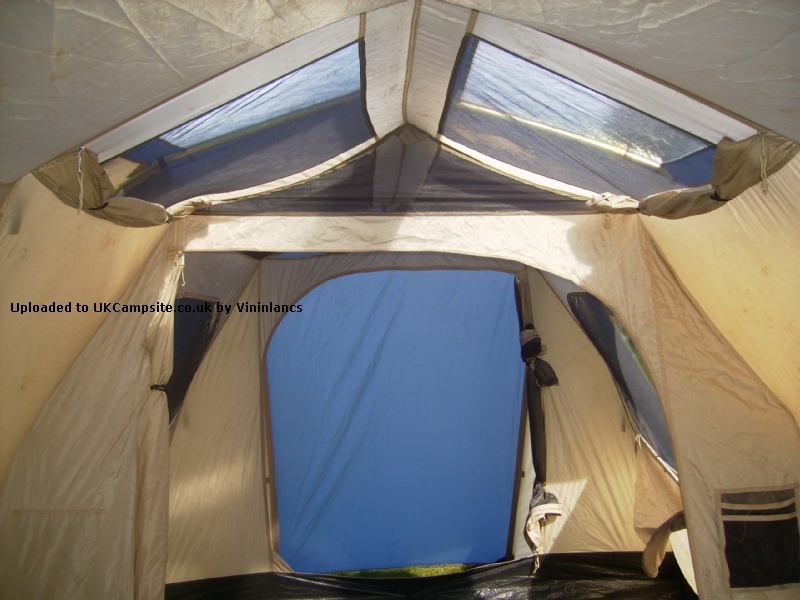 The key to this tent is its versatility and you can have the option of any of six doors open. In theory though 2 or 3 would be ample.All the doors and windows have both fly-screen and covers, and on a nice day you can Zip the doorways back, zip up the flyscreens and you have fantastic views out of the tent and you are bugfree. 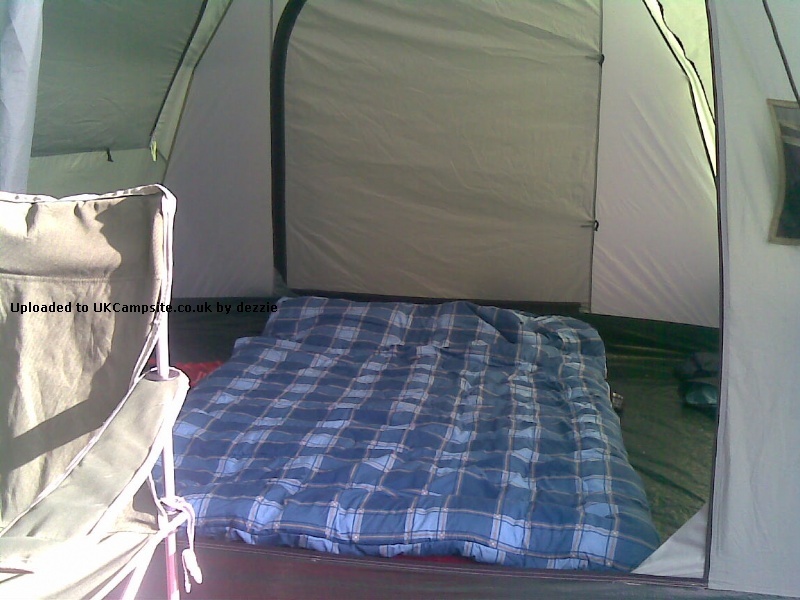 The tent also has plenty of tie backs and there are tidy alls in both the bedroom and living area. The groundsheet is very adequate and bug-proof. I would expect this tent to outsee some terrible weather and live to tell the tale. Downside, a very heavy tent, I have split the poles into a separate holdall to make life easier. This tent can be put up by one person ,but is far better with two. If on your own, just assemble 2 sections of the framework at a time, and then ring and pin them , and move to last 2 sections . 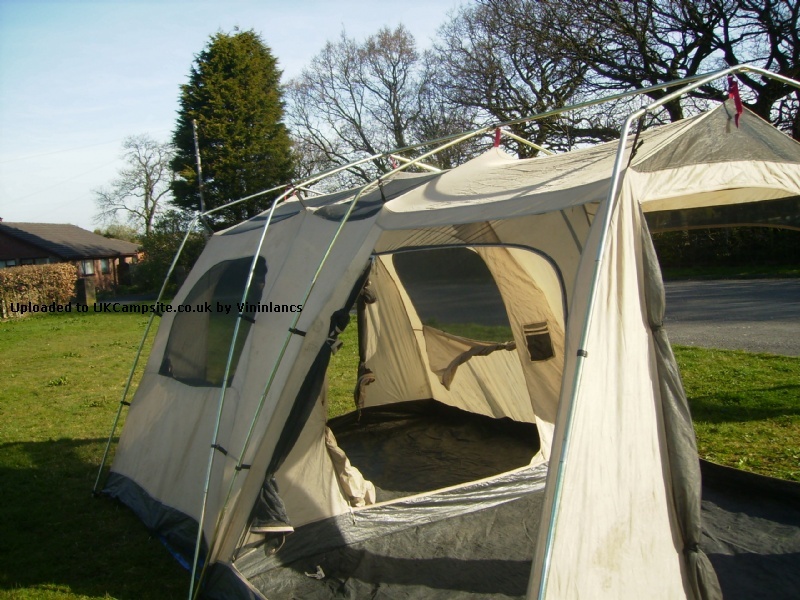 Once framework erected and pinned tent is very sturdy. This is our second year of using our Gelert Utah and I can agree with everything already said. We have just had a week in Scotland with several extremes of weather, including 24 hours of constant heavy rain and high winds. The tent stood up to it all without any problems. 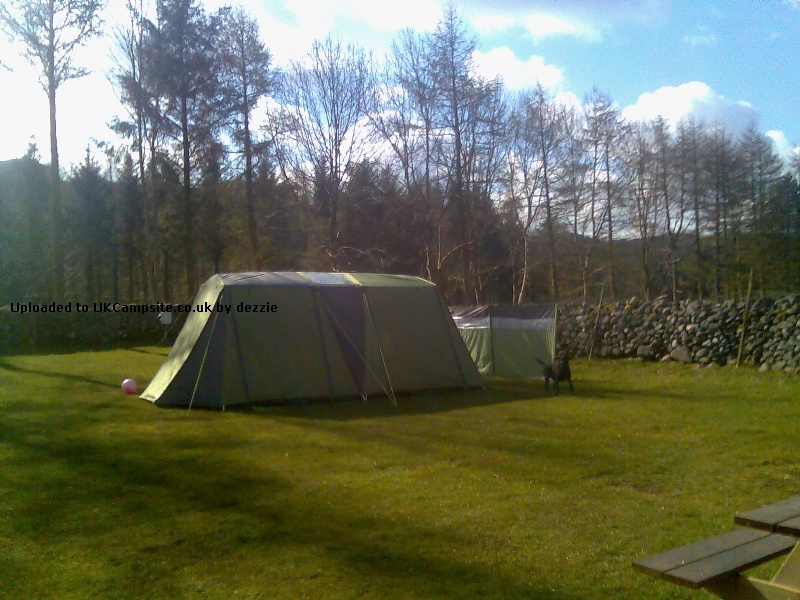 Plenty of room for a family of four and an all round practical, reliable tent. This is the best tent I've used so far. We put a Gelert comfort quickbed in and still had plenty of room in the bed area. Very quick to erect with plenty of room for everything else in the living area. We kept our fridge and bin in the end compartment at the front and other stuff in the rear end compartment. I really can't fault this tent. 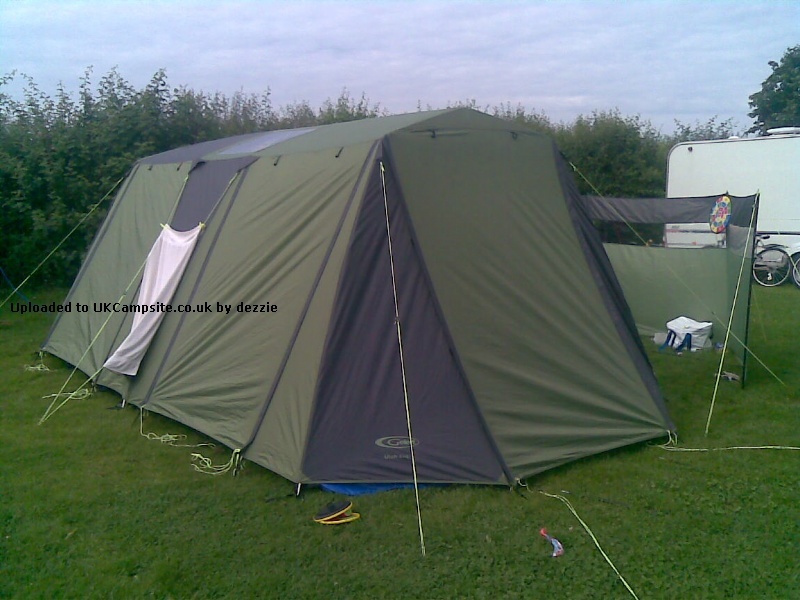 This is a great tent for short and long holidays as its so easy and quick to erect. We took it out for a two week tour of Cornwall and had no problems. 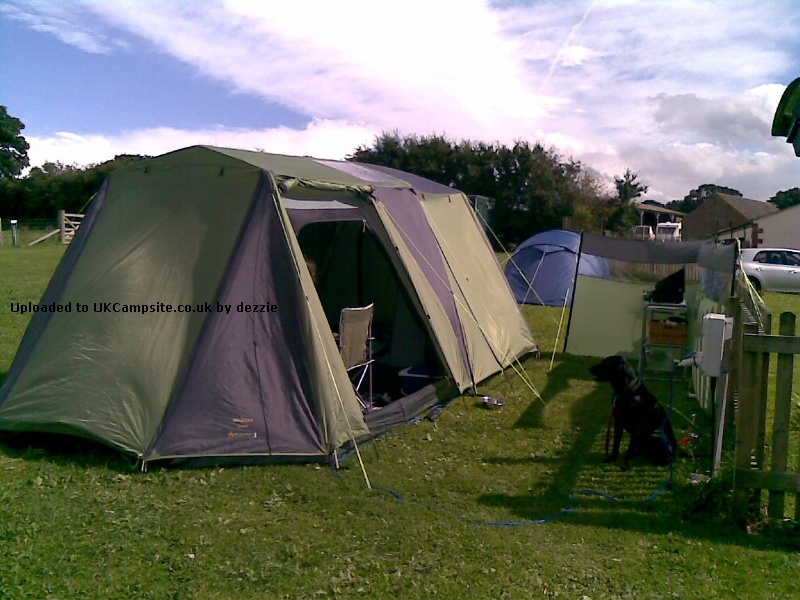 There are only the two of us camping, so perhaps we don't really need such a large tent but its great for those longer holidays when you have loads more equipment. The only down side is the weight of the bag, if like me you are 5ft 2in its a tad heavy! Can't fault this tent at all.It's fantastic, we camped the other week in all the storms and it was so sturdy. Very roomy, living area is big enough for table and 4 chairs also kitchen equipment,when wet outside,bedroom sleeps 4 comfortably, can fit in 4 single airbeds with room to spare. WHAT A TENT! 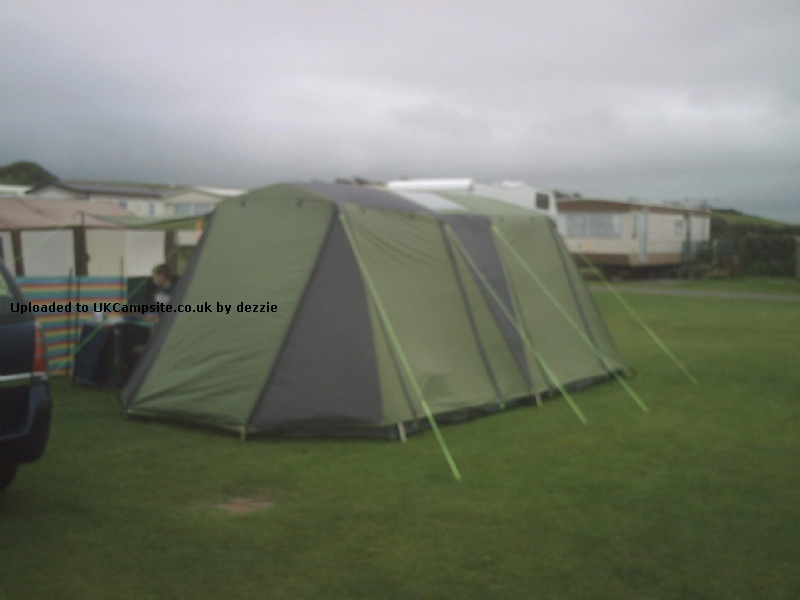 Just got back from a trip in our bargain tent it cost �109 and is great. We had every weather extreme going. The first day was boiling, so up went the 3 doors in the living area and we left the mesh down on the inner so no bugs could get in full panoramic views, brill. Next day was very windy with rain tent held up really well, then at night it absolutely hammered it down I lay in bed and thought we were gonna be flooded for sure, not a drop! got up next morning and there were big puddles everywhere outside. 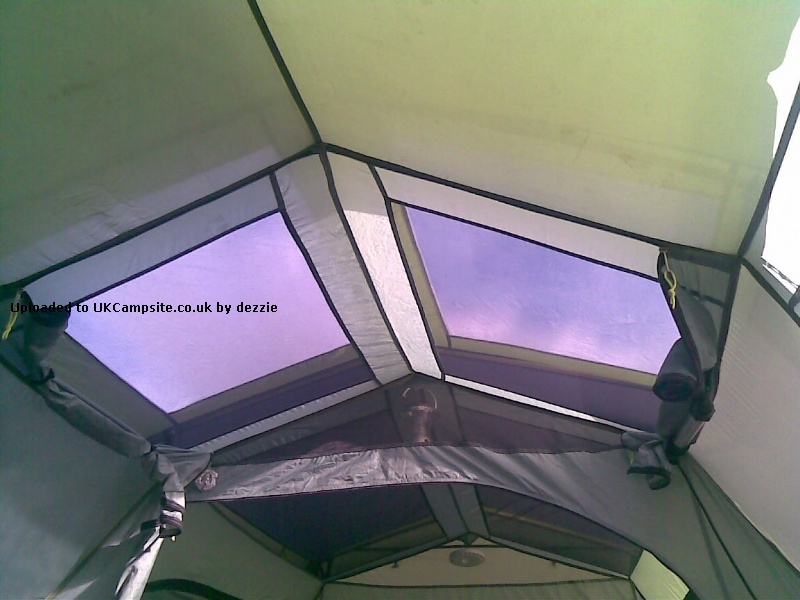 I'm so impressed with my tent lovely and roomy, airy and light two big roof windows, big living area and sleeping area. Would have given it a 10 if it had of had some kind of window to look out of in the rain. But hey! 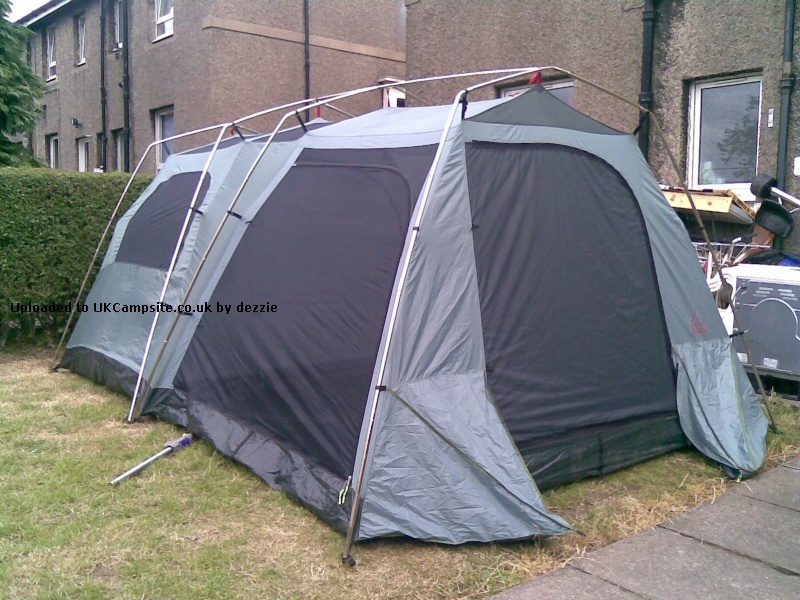 there's probably tents with loads of windows and nowhere near and strong as this one! excellent tent, bargain at mo! This is the Best tent our family has owned, though ours is the older model it has everything the newer one does except the boot stores & bedroom divider. 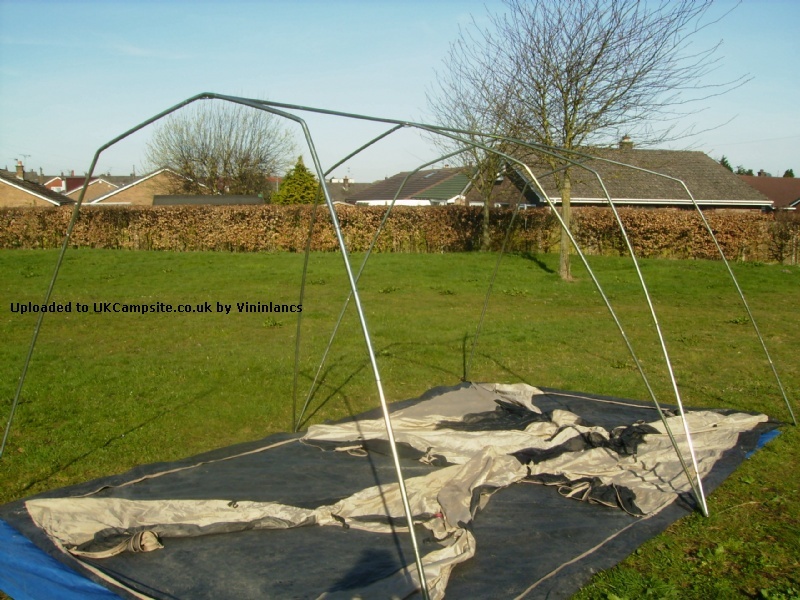 It has always performed well in rain or wind and is fantastic on hot sunny days as the 6 doors in the fly sheet can be rolled up or turned into canopies. 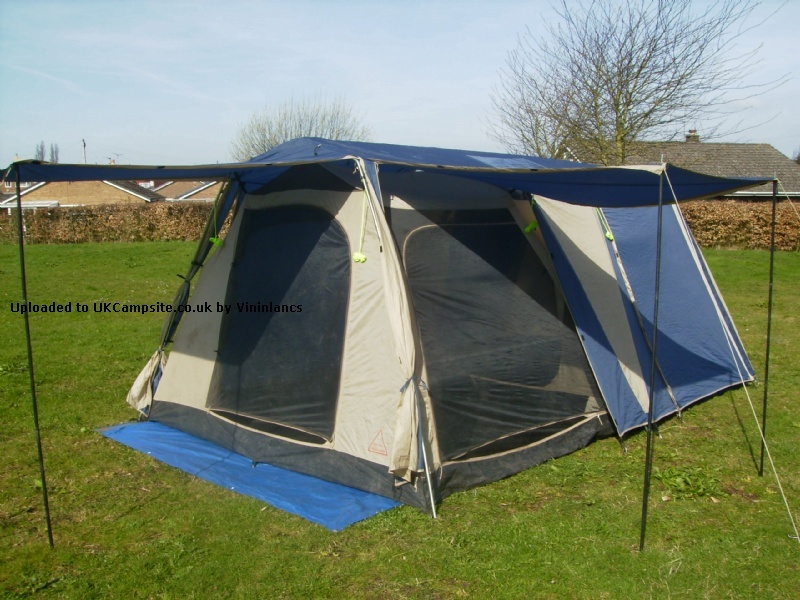 The poles are heavy but once erected give a good sturdy frame, the inner tent is the main reason I bought the tent because all the doors are fly meshed so even at night you can be midge free with all doors open. Size wise it's good, the height is brilliant, I've had a table, 4 chairs & cooker etc in ours with no problem & the bedroom slept two adults & two teenagers comfortably & now the kid's do their own thing, it's VERY comfortable for just us two old fogies! My family and I have been using the Gelert 4+4 for the last years camping trips. The tent is very sturdy due to the steel pole set up. Basically the poles go up, then the inner (which is slightly disadvantagous in the rain) then the flysheet. All in all it takes about 25 minutes from bag to guy down. 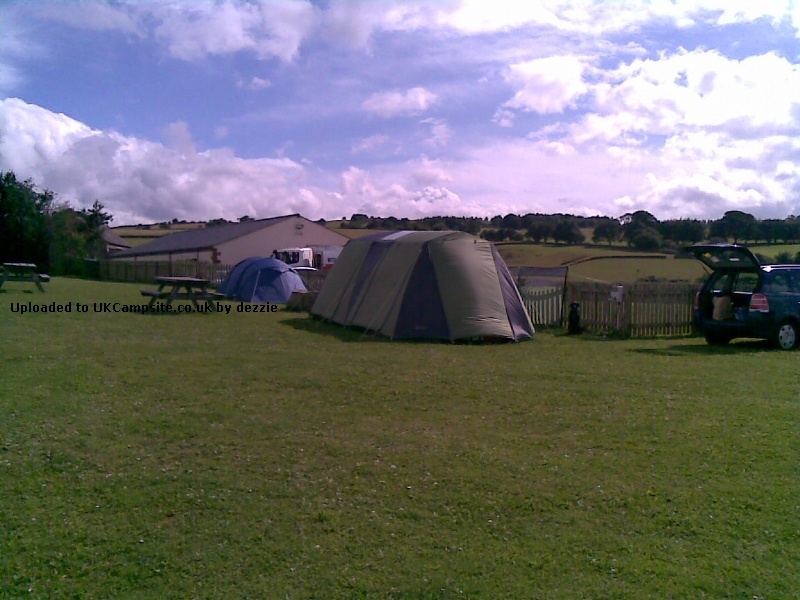 The tent has one large living area, which is sufficient for our family of 5. Theres a great feature either side of the front door - Boot stores! These are like little cupboards and as the name states great for storing shoes boots etc. Also they are great for storing essentials like milk and juice in the colder nights. Also at the rear of the tent is another door, which when opened can be used to store the tent bag and various other bits and bobs. 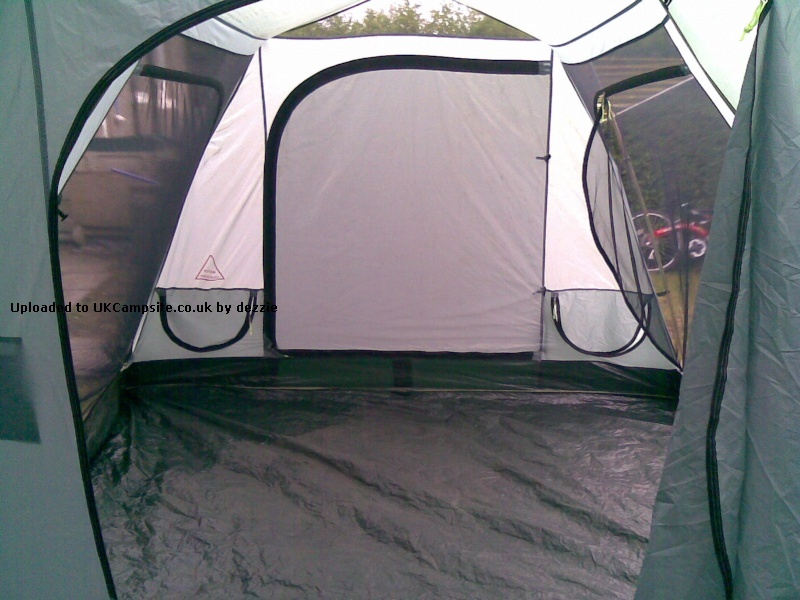 The tent also has a zip for an electric cable to come into the tent at the side. There are no windows on the walls of the flysheet, but there are 2 skylight windows that let sufficient light in and it is a very bright airy tent even with the lack of windows. 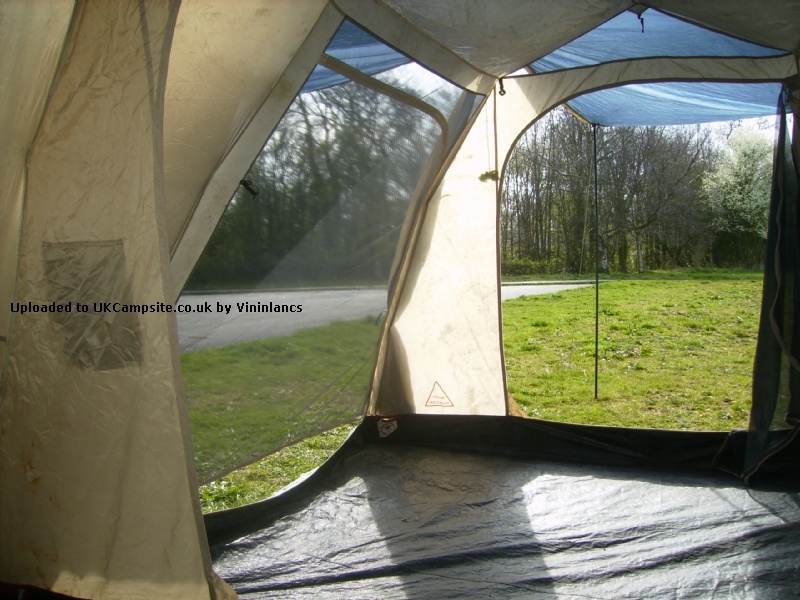 For more ventilation the tent has 6 - yes 6 external doors all double skinned and all can be set up with the canopy poles - although only 6 poles are provided - to be honest the only doors you would really open out would be the living area ones. The bedroom area is roomy and sleeps 4 comfortably. It has a room divider, but we dont use it, as there are better layouts for sleeping without it. The room has 2 mesh windows for sunny days and also a door at the back for emergencies etc. Theres also a zip door between living and sleeping areas. The entire inner is sown in and its the bathtub type groundsheet, so no draughts or beasties! One thing that I really like about our tent is the fact that is is really a double skinned tent, as even the living area is double layered with the inner and flysheet. This also stops wind and the cold coming in - and its VERY effective. 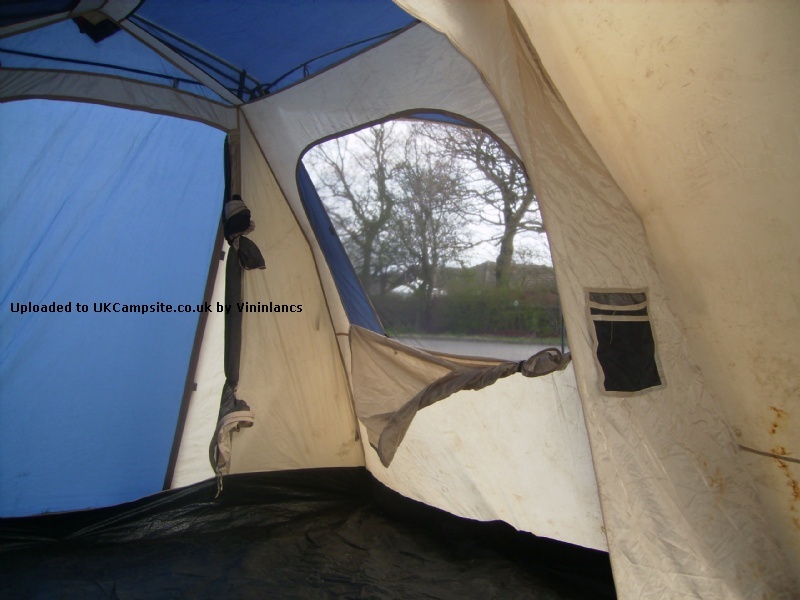 We have used the tent in some very heavy rain and some very high winds and found it to be extremely stable - Infact once we were away and every other tent in the field was down except ours after a very stormy night. Now to the downsides of the tent - and there arent many to be honest. Pitching the inner first can be a bit of a nuisance as I mentioned earlier. The bag is large and heavy - although the poles are the heavier item in the bag. Apart from that I really cant fault the Utah 4+4. We got ours for �119 and its been the best tent we have ever owned. Add your review of the Utah 4 + 4! 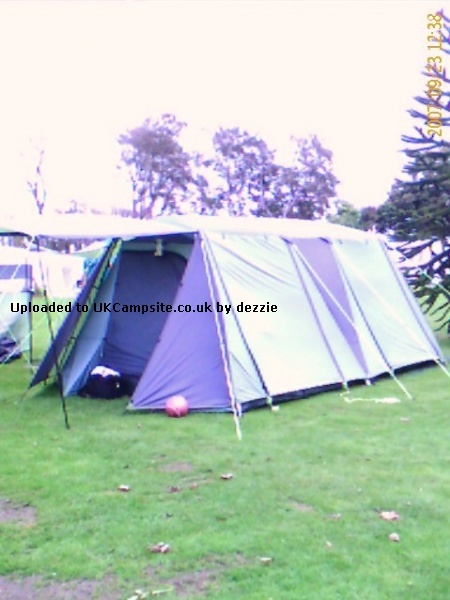 The Gelert Utah tent is a stable, solid attition to the Gelert range of family tents. 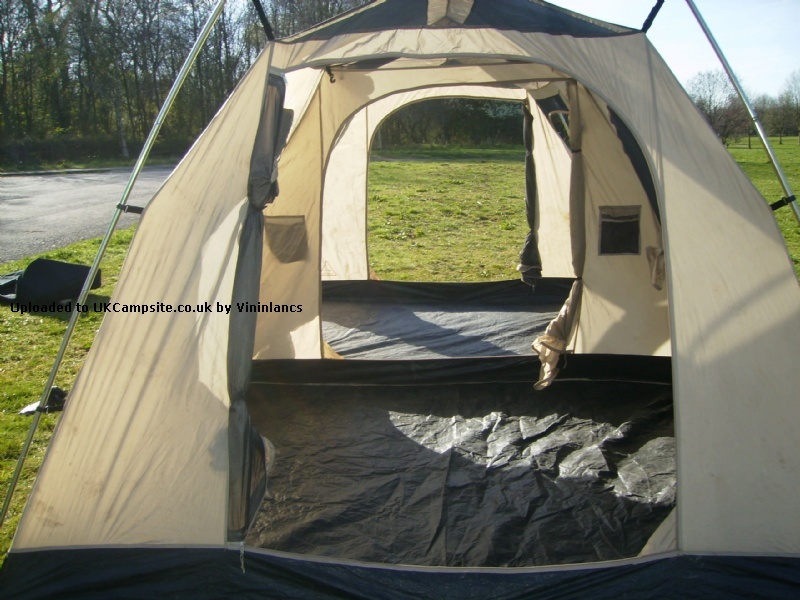 Space and height are in abundance, this tent will make you the envy of the campsite.